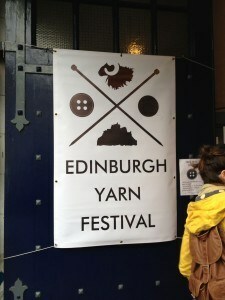 I am probably the last in a long line of Edinburgh Yarn Festival goers to blog about the wondrous event, but we only got back yesterday and there was the dreaded unpacking and clothes washing and hoovering to do before I could settle down to the blog. 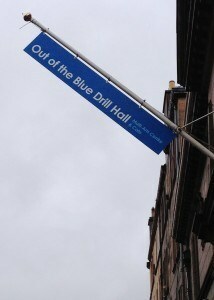 Saturday morning was dull and drizzly, but spirits were never less damp in that queue outside of the Out of the Blue Drill Hall off Leith Walk. I might also add that never was I quite so happy to queue in the drizzle! I hardly took a photo – I was a little distracted! 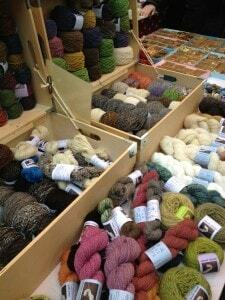 There were 40 stall-holders and it was hard enough politely edging into see some stalls, never mind get the camera out. When I say “polite” that is definitely a good word to describe the crowd – polite and eager. I have been in squashy, busy situations before, but never were the squashers and the squashees so polite about it! One woman (in a lovely chickadee sweater (I saw three variants of that design)) said, “I am sorry – but isn’t this all MARVELLOUS?!”. …are you feeling slightly seduced yet? I had to move to the edges of the room to take it all in! Heady! 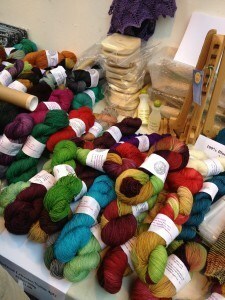 There were forty stall holders in the Drill Hall – two thirds more than organisers Mica, Jo & Linda originally thought they might host when they began planning Edinburgh’s inaugural (and long overdue) wool celebration last year. The hall was very well organised despite the jostling (I was worried that everyone’s lovely woollens would be felted at the shoulders due to the mixture of drizzle and friction!) – I think that the venue was far more characterful and sociable than other events held in conference centres and the like, which lack what the Drill Hall offered. What they achieved was nothing short of wonderful – not only did they host a vast delegation of stall holders and have classes with top instructors, but there were organisations like KidsKnit and The Seamen’s Church Institute and they brought together over 1400 like minded people, from as far a field as Switzerland! 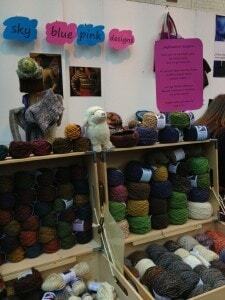 I know myself that it was lovely to say hi to some of the faces behind twitter and ravelry avatars. I was honoured to be part of the fun and I really look forward to the next event…maybe over two days, next time?! I will blog about some of my purchases later, but here are the contents of my three bags full! 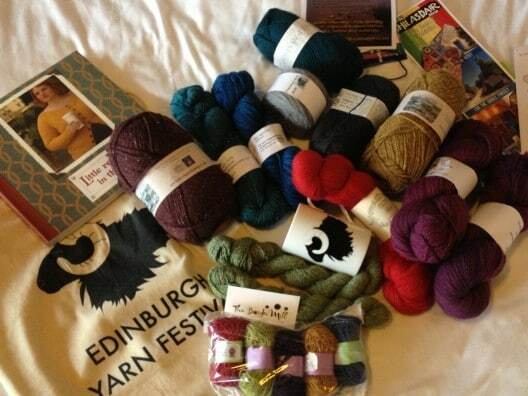 clockwise: Edinburgh Yarn Festival bag, Little Red in the City, New Lanark Donegal Aran Silk, Ripplescrafts ND 4ply, Ripplescrafts merino sport, St Magnus DK, Wensleydale longwool sheet shop, New Lanark, Old Maiden Aunt Corriedale 4ply, Juno Fibrearts, EYF mug, Border Mill Alpaca and mini Rennie balls!